The world-renowned choreographer (and native Seattleite) Mark Morris teams with YoYo Ma’s group for a new work of music and dance based on the Middle Eastern story “Layla and Majnun,” the Romeo and Juliet of Middle Eastern and Asian culture. Few stories capture the hearts of people all over the world as reliably as one about ill-starred lovers. No matter that we all know the outcome of “Romeo and Juliet” — their plight perennially moves us. Another of the world’s great love stories, “Layla and Majnun,” dates back long before Shakespeare. Its most famous literary expression, a verse romance by the Persian poet Nizami Ganjavi, has been casting its spell over Middle Eastern and Asian audiences for nearly a millennium. “It conveys a message of profound, abundant, eternal love,” Mark Morris says. 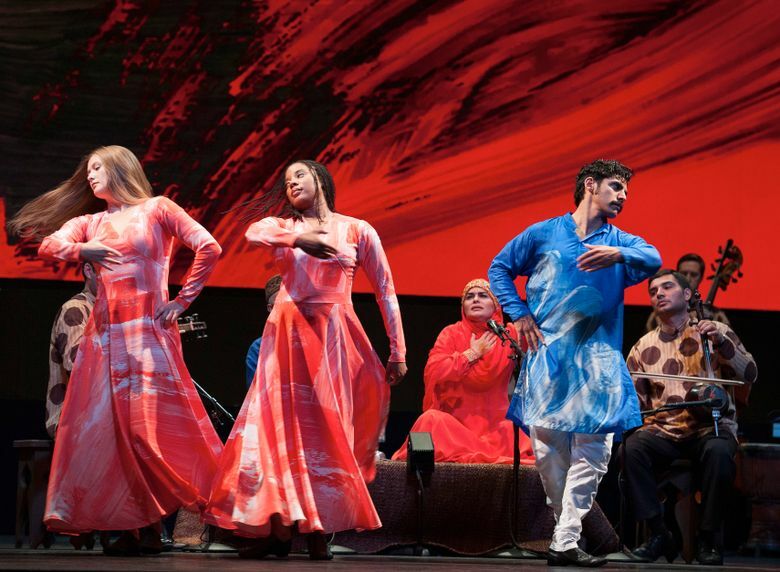 The world-famous dancer, choreographer and director, who turned 60 in August, returns to his native Seattle with his latest creation, the dance theater work “Layla and Majnun.” Opening the season at Meany Center for the Performing Arts, it will run from Oct. 6 to Oct. 8. 8 p.m. Thursday-Saturday, Oct. 6-8, and 2 p.m. Saturday, Oct. 8, $48-$65, Meany Hall, University of Washington, Seattle (206-543-4880 or meanycenter.org). “Layla and Majnun” was already a widespread tale in Arab folk tradition by the time Ganjavi treated it in the late 12th century. In love with each other since childhood, the couple are kept apart by Layla’s father. He forces her to marry a rich older man, but she remains faithful to Majnun. The name of her beloved literally refers to someone possessed or insane, for Majnun is consumed by his passion for Layla. As a wandering ascetic, Majnun composes verses to her and eventually learns of her illness and death. When he finds his way to Layla’s grave, he falls lifeless over it. A dozen dancers from the Brooklyn-based Mark Morris Dance Group — including another native Seattleite, Aaron Loux — are touring as part of the production, which was commissioned by Cal Performances of UC Berkeley in association with the Meany Center and a handful of other organizations. Seattle will be the show’s second stop after its world premiere in Berkeley on Sept. 30. Silk Road members Johnny Gandelsman and Colin Jacobsen distilled the 3.5-hour opera into a chamber scoring of an hour or so that mingles Western strings and percussion with Asian instruments.